1. Healthy soft LED light, can protect your eyes. 2. power with 6W,energy-efficient and durable. 3. Simple assembly, Waterproof design, easy for yard decorating-set it up in a few minutes. Ideal for Halloween, Christmas, Birthday Party, Wedding, Veterans Day, Game celebration party, and more. Perfect for the holiday season Creates an instant atmosphere for parties and entertaining. 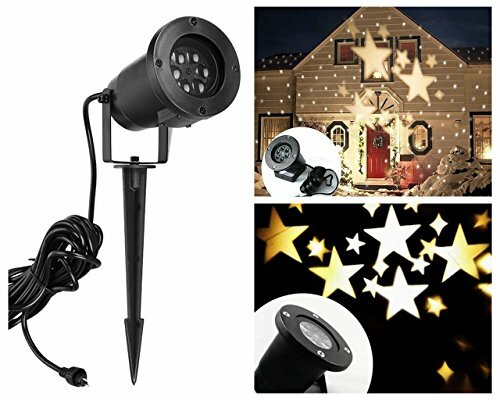 Wide Application: Star projection light designs for different occasions, Christmas decorations, birthday party, wedding decor, suitable for interior and exterior windows, kid's room, bedroom, garden, yard, landscape, patio. Also can be a holiday gift. Diameter: 3.86inch, H: 12.6inch. UL adapter 12V DC and 6.6 feet cable, and 20 feet cable connect with the light, use more flexible. User- friendly: the projector lamp comes with a base and a long spike, it can be inserted into the ground. When the stake removed, it can also be mounted to a structure using a sturdy hanging clamp and safety cable. Place light approximately 12 to 16 feet from the projection surface after the light is turned on you may need to adjust the distance to get the best effect. Waterproof (IP65), even use in the rain weather, but can't use in the heavy rain. Easy install, use indoor/outdoor. It will have perfect effect in the dark place. If you have any questions about this product by LIGHTESS, contact us by completing and submitting the form below. If you are looking for a specif part number, please include it with your message.